Part of my work as a teacher educator is to continually educate myself about resisting the reproduction of racism in the classroom. Part of my work as a white teacher educator is to find opportunities to share what I learn. This post is an expression of the latter. Without going into too much historical context about me, I grew up in a mostly-white community on the east end of Long Island in New York State. For most of my early life, I encountered people who looked like me. I read books about people who looked and sounded like me. I rarely encountered a discussion about race that made me feel uncomfortable. What I knew of race and racism, I largely learned from television, movies, and books. Which leads me to part of my point: the print and digital texts we bring into our classrooms have an impact on our learners toward shaping their experiences of the world. With the development of technology especially, I spend a lot of time thinking about this. And right now, I think about it in the wake of the summer we have had. Too many lives lost before and since. I know that it’s not enough to take stock of and change the curriculum or the books we use to ensure that they reflect a more racially and culturally authentic representation of our society. But for many, it’s a place to start. And I would argue it’s a necessary first step for any teacher educator. While we all know a lot happens in between a teacher candidate’s formal teacher prep training and leading an actual classroom, we also know that a lot of ideas transfer to practice. The things we do in front of our candidates every day make an impact. Just like we teach them that the things they do in front of their students every day make an impact. I hardly have all the answers, and just like you, I will make mistakes and bungle explanations. But if we don’t, as my oldest and dearest teacher friend often says, “use our power for good,” out of fear of sounding unintentionally racist, we miss the opportunity to be a part of the solution — an opportunity that will present itself again and again if we look for it. The equity that so many say we want as a society is available, but it will not just magically appear. We have to actively press and urge and uncover. What better place to do so than in the teacher education classroom? In a place where teachers — the people who will literally be teaching the next generation of learners — are doing their own learning? Consider the textbooks you’re using. Depending on the dynamics of your department, you may have little wiggle room for choosing textbooks, or you may have complete autonomy. Most of us fall somewhere in the middle. Fight for the opportunity to use alternative texts, especially if compulsory texts are published by large, profit-hungry corporations. Or if that’s not possible, supplement more mainstream texts with ones that more realistically reflect the way structural forces in society actually operate. For instance, when a literacy methods textbook makes a generalization about the low literacy levels of children living in urban areas, pause the discussion to look at what assumptions are being made and what’s not being said. Depending on the context, supplement with articles and blog posts, or even Facebook status updates, from brilliant colleagues who elegantly speak the truth about the way things are. Consider all materials you use — not just the textbooks. Depending on your discipline and course content, you may be using all kinds of different materials to teach your candidates. I know intimately just how many piles of hands-on resources we teacher educators lug to our classrooms! As you gather your materials at the start of this semester, ask yourself some questions: who are the literacy texts written for? Who wrote them? Who are the characters? What theoretical undercurrents are being promoted by the materials you’re using? What’s not being said? What needs to be said differently? What if we shook up the script on how books make their way to the classroom shelf? What if teachers always got to choose the materials for their classrooms? What if teachers had the opportunity to weigh in on who manufactures their students’ learning materials? What if we had more of a choice to acquire affordable classroom materials from vendors who don’t exploit their workers? Practice what you teach. While you can do a lot to intentionally decide to choose books and materials that step outside the dominant, white-supremacist discourse that pervades so many of the materials in our classrooms, you have to consider the way(s) in which you teach, too. Anyone who teaches teachers knows that you have to not only know the content that you teach, you also have to know the pedagogy behind the teaching of that content (for more on this theoretical frame, see TPACK). Everything we do — every assignment we give, every discussion we facilitate, every interaction we have in our classrooms — is game for being a teachable moment. Just like K-12 students are sponges, so are our teacher candidates. They pick up on the ways in which we do just about everything. Own that you don’t know. This summer, one of my teacher candidates shared this observation about my teaching: “You always show us the ways you’re not perfect. You show us that there’s always more to learn.” We hadn’t been talking about race or racism, but the comment touched on something that made me think: we have to admit that we don’t know it all; otherwise, we blind ourselves into falsely thinking that we do. This can apply in a variety of ways to the teacher prep classroom — most certainly to the internet and all other tech-y things coming down the pike — but it can also apply to how we are in the classroom and the assumptions we may make about our students and colleagues, whether intentional or not. We can certainly try and understand what it’s like to be a person of color, but we shouldn’t draw parallels when there aren’t parallels to draw. To put it another way: it’s really okay to try and understand what it’s like to experience racism, but don’t claim to understand when you kind of actually can’t. Parallels can be helpful, but not when they just scrape the surface, and in some cases, even co-opt the narrative. Don’t token your students. This one’s pretty basic: be mindful of turning to your students of color to teach the class about what it’s like to be a student of color. And also, when you do take time out to talk about racism, structural economic forces, the election — whatever topic disrupts the dominant discourse in your classroom — consider your approach and engagement, generally. How are you facilitating the discussion? Who are you calling on? Do you favor anyone? Ignore anyone? Did you check in with anyone who appeared to be uncomfortable afterward? Don’t let the tricky stuff go. The night after the non-indictment of the police officer who killed Michael Brown was announced in Ferguson, MO, I taught a class on teaching literacy to early childhood teacher candidates. All day long, I thought about the connections between what I was doing as a teacher educator and what was going on in the country on that day. I wanted to talk to my students — really talk to them — about the work we have cut out for us, and the opportunity we face as teachers to help shift the tide of racism in our society. I ended up poorly facilitating a discussion that night that ended with a white student exclaiming, “but I didn’t cause slavery! ?” Clearly, I had failed at helping her see a connection between the non-indictment and the stories about our society that are told in the books on most school shelves. But I share it to say that even with the best of intentions, doing this work does not always mean you’re doing it ‘right.’ We start at the wrong place in the narrative. We make assumptions that are incorrect. We cannot always convince the most conservative, racist, sexist bigot in our classrooms that there is a connection between racism and literacy (or mathematics, or art, or history, or whatever your discipline), but you will make someone who had previously not considered race in the context of their classroom library go home and consider it. As much as I am frustrated by incremental change lately, I have to admit that that is a step in the right direction. Add anti-racist elements to your classroom. Sometimes, we end up with materials that send a specific message about how things are set up (for example, books in which all the doctors are white and all the nurses are Black, or posters on reading in which all the pictures are of white boys and their puppies, or outdated toys that reinforce the status quo). And in the face of more budget cuts in education, sometimes it’s all we have (which is ludicrous IMHO). If you can’t replace the materials you have available to you in your classroom, then alter them. Here’s a related example: a few months ago, a friend donated her kiddos’ toy cars to our 17-month-old son. And though we don’t need two of these little cars, having two is awesome when other kiddos come over to play! But one of them is a police car, which feels awkward on several obvious (and some less obvious) levels. We haven’t decided yet if we’re going to spray paint it or just try and find another little car to have around, but in the meantime we added a #BlackLivesMatter sign. 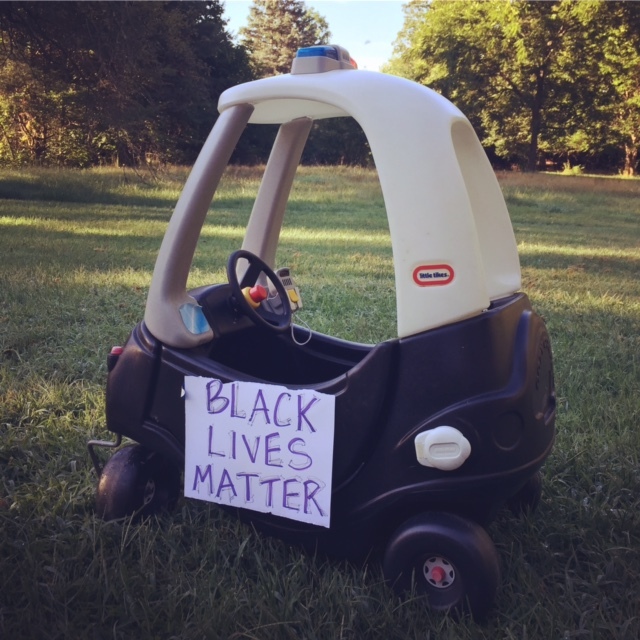 What if every 2nd grader throughout the U.S. encountered a police car with a #BlackLivesMatter sign on it? How could (or would) that alter the narrative around power and policing? If you’re still not sure about BLM, read this helpful blog post, and consider talking about it in one of your classes. Listen at least as much as you speak. As teachers and teacher educators, we probably all need to work on this. Myself included. I want to get things right. I have an incessant need to check things off my list and move on. But in reality, the more I stop talking, pause, and listen, the more I learn. While it is our collective responsibility to teach the next generation of teachers how to teach, and speaking to/at our teacher candidates is a huge part of what we do, I want to argue that we have more to learn and teach by opening a dialogue than we do by dictating facts. The next time you find yourself whitesplaining, take a breath and maybe let someone else say something — whether in the classroom, a committee meeting, or anywhere else your daily life might take you. I pledge to do the same. What I’m talking about here is the traditional legacy of teacher education methods courses: you do with your students what you hope they will turn around and do with their students tomorrow, next week, next month, or next year. So if you aren’t already talking about race, and you’re interested in the project of creating an anti-racist society, I urge you to push yourself this semester not to let the little things slide. Push yourself to see if the books you’re using promote colorblindness. Push yourself to see if you can, in your own everyday way, help your teacher candidates see their potential for being anti-racist, anti-sexist educators in their future classrooms. If not today, then when? ?